For those readers who can’t get enough of the Occupy movement, you should check out the incredibly detailed and multifaceted data available at Occupyresearch.net. 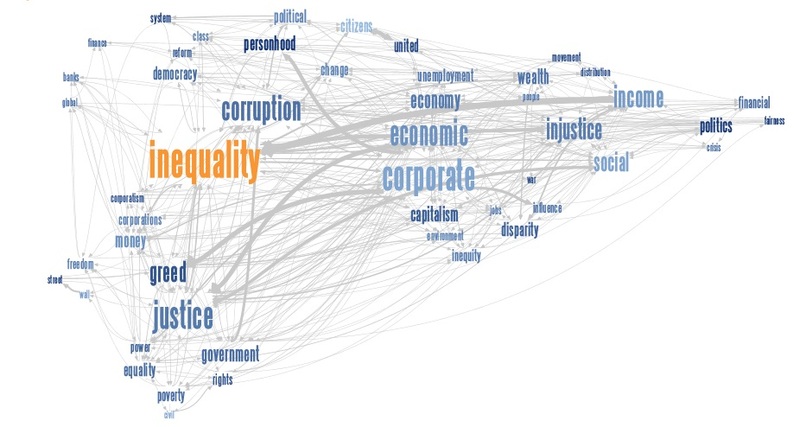 Highlights include preliminary findings from a survey of Occupy participants about their involvement in the movement (with maps breaking down responses geographically), visualizations of tweets about police misconduct, a collection of images of the Occupiers, and an analysis of the organizational network composing the Occupy movement. I’m just barely scratching the surface. The people behind Occupyresearch.net, which includes scholars from MIT’s Media Lab, have done an incredible job of pooling available data and then using an open source approach to data analysis. One of the coolest ideas on the website is to draw on the ethic of the Occupy movement to engage people in data collection and analysis. The working group sponsors “hackathons,” where anyone who has questions about the Occupy movement can come together and use the site’s tools and do interesting, innovative analysis and data visualization. This is also a great tool for social movement undergraduate classes. The interface is easy enough to navigate that any undergraduate should be able to do some basic analysis, test hypotheses, etc.